When a fictional world is well crafted, returning to it becomes an absolute delight. Becky Chambers’ Record of a Spaceborn Few is her third foray into the world she created originally in The Long Way to a Small, Angry Planet and revisited in A Closed and Common Orbit. Record is very different. 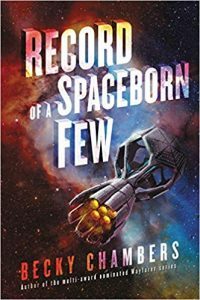 It travels to a different part of a now familiar galaxy, and in typical Chambers’ style it is warm, caring, intimate, thoughtful, deep, and surprising. She is a terrific writer, creates amazing characters, and takes them on unexpected journeys. Each of the books stands alone, but the depth of her writing can best be appreciated by taking all three of them together (and any more she chooses to create in the future). Record of a Spaceborn Few follows several characters living on one of the Exodan ships. These are massive ships that were built using the metal from cities on Earth, cities which were becoming depopulated as the Earth was destroyed by human environmental destruction. Survivors used the ships to flee the Earth, eventually being rescued by an alien race which introduced them to the rest of the galaxy. Those ships still held a large number of humans even after years with opportunities to settle on other planets. Tessa is the sister of Ashby Santoso, captain of the Wayfarer, whom we met first in The Long Way. She lives with her two children and (when he is not working mining asteroids) her husband in the family home, along with her father. Kip is a teenager struggling to figure out what he wants to do with his life. Sawyer is a young man who grew up on a planet but wanted something else and decided to return to his ancestral home onboard ship. Isabel is an archivist, charged with keeping a record of everyone and everything that happens on board the ships. And Eyas is one charged with caring for the dead, recycling their bodies so that the ship can benefit from their component elements. These characters lives intersect from time to time, but the book is really the story of each of them living (well, mostly) through the same time period and being affected by the same events. Chambers does several things so well in her writing. Each of the characters has a voice, unique interests and motivations, perspectives that in common show their common shipboard experience and in separate that show their unique perspectives. Tessa is a tired mother working a dead-end job which might end with technological advances. Kip is desperate to get off the ships, but struggles to figure out who he is and what he really wants. These differences and those of the other characters are made clear in the conversations they have with others and the choices they ultimately make. There are so many threads to follow in Record of a Spaceborn Few! What would a society be like that has lived in space, off planet, for generations? Who would leave if they could? Who would stay regardless? How would someone fit in who did not grow up in that society? Chambers does not ignore the technological aspects involved in building her world, but the real effort is in showing the society. Can humans truly ever live in a perfectly equal and egalitarian society? Or will we always want something more: power, wealth, authority, status, control? And if that equal status is disrupted by, for example, alien technologies, can the balance ever be fully restored? Record of a Spaceborn Few is fantastic! If you read Becky Chambers first two books you will like this one. If you haven’t met her works yet, now’s the time to get started.